Just Between Friends partners with many groups, businesses and charities to make our events the best they can be for the community. By doing so, we are able to reach more people with more services and opportunities. We work with local businesses to provide them a venue to share their products and/or services in our community. Email Laura at laura@jbfsale.com to receive more information about vendor spaces for our upcoming event. We work with corporate partners to share family-friendly businesses with our shoppers and consignors. We work with many local schools, Mom's groups, daycares and scout troops to provide fundraising and volunteer opportunities. We proudly work with our charity partners by promoting their organizations and donating unsold items and monetary donations. Email Michelle VIPTagger@gmail.com for charity information. Reaching out to our community is the heart of our business! The picture to the left shows children in an orphanage in Uganda. JBF Colorado Springs partnered with Compassion International to send our donated children's books to this orphanage to start a library for the children. 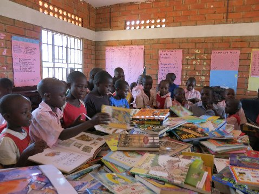 Thanks to the generous donations of our consignors, these sweet kids have a new library! We are thrilled to partner with several local charities through the generosity of our consignors, shoppers and volunteers. Thank you for helping us support our Colorado Springs community over the last 10 years! Your generosity is a blessing! Charity Partners have included: Children's Hospital, Compassion International, Peterson AFB Airman's Attic, USAFA Airman's Attic, 1 Can I Can, Life Network, Crossfire Ministries, One Nation, St. Luke's Food Pantry, Springs Rescue Mission, Catholic Charities and The Marian House.